A common perception about poor situation of law and order and terrorism in Baluchistan is that it is due to underdevelopment, military operations, death of Nawab Akbar Bugti and utilization of resources of Baluchistan. A vital role has been played by our liberal, pro-Indian journalists and politicians in spreading this perception. Our progressive and liberals blame Pakistan army for the whole situation and our politicians support these baseless allegations in order to prove them innocent. However, on 7 July 2013, while addressing 23rd session of UN’s Human Rights Commission, Mehran Bugti claimed that the reason behind the liberation movement of Baluchistan is that in March 1948 Baluchistan was forced to merge into Pakistan through military power and afterwards representatives of USA and UK also supported this allegation. This proves one thing that at least whatever our media, India and international media has been deceiving the international community and Pakistani nation that target killing and terrorism are reaction of deprivation of Baluchistan and military operations there; on the other hand this also proves the Indian involvement in terrorism in Pakistan and support of USA and UK to terrorists as well in order to blackmail Pakistan for their damn interests. 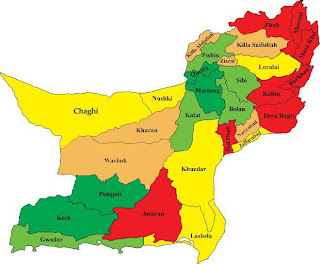 If we look at the history of Baluchistan after partition in 1947, it becomes evident that militancy in Baluchistan started in March 1948 when Khan of Qalat Mir Ahmed Yar Khan signed deal for accession with Pakistan and his brother Mir Abdul Karim Khan rejected this accession, announced accession of Qalat with Afghanistan with the support of Ghaus Bux Bazanju and other supporting tribes and started Gorilla attacks on state and military installations. 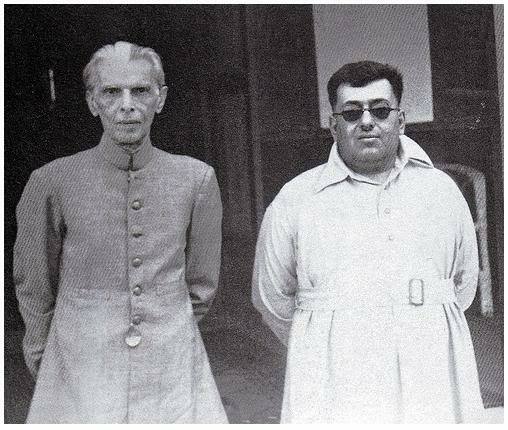 Khan of Qalat had not decided accession with Pakistan within a day, in this regard Founder of Pakistan Quaid-e-Azam Muhammad Ali Jinnah met twice with Khan of Qalat from January 1948 to February 1948 and satisfied all of his concerns. After these negotiations 7th March 1948 was fixed as the day for signing ceremony, however when Khan of Qalat did not arrive Karachi due to pressure from Afghanistan and from his supporters, Quaid expressed displeasure over this breach of promise. In order to pressurize Khan of Qalat, Ghaus Bux Bazanju said that he does not accession to Pakistan as being a separate state, on the same principle Iran and Afghanistan should also accede to Pakistan. Quaid was aware that India was behind the pressure over Khan of Qalat who was utilizing Afghanistan for her damn plans. Khan of Qalat was also that accession of his state with Afghanistan is unnatural and would result in seclusion of his subjects. So he signed deal for accession with Pakistan on 27 March 1948 at Karachi. This was the time when the militancy started in Baluchistan and when terrorist activities of Mir Abdul Karim Khan grew intolerable a military operation was initiated against him, he was arrested and imprisoned. In this way first operation in Baluchistan was conducted in 1948 as Pakistan had no other option except army against terrorists, equipped with latest weapons of that time. At that time neither there was any problem of missing persons or mutilated corpses; the whole dispute was of separation of state of Qalat which was surrounded by Baluchistan a part of Pakistan since partition. As long as Abdul Karim Khan was under arrest peace prevailed in Baluchistan. In 1955 on the request of Khan of Qalat and on the condition of Abdul Karim Khan acceptin Qalat as part of Pakistan and staying away from militancy he was released from the prison. After remaining peaceful for a year Abdul Karim started militancy again, before starting his treachery he negotiated with many tribes but they rejected support to him. However, Mari, Zahri tribe under the leadership of Mir Gohar Khan and Nawab Naurez Khan not only accepted to join militancy but went a step ahead of the terrorism what today’s BLA is doing while targeting Pakistan armed forces and defense installations. In Quetta and other districts, Punjabi inhabitants living there for more than 4 generations became target of this organized terrorism, sabotage of railways became was common and during gorilla attacks over army convoys latest of that times were used; so this question arose at that time as well that who is supplying these millitatns or terrorists with latest weapons and training? At last in 1958, a military operation was conducted in which Nawab Naurez Khan along with his two sons was arrested while other leadership of treachery succeeded in flying to safe havens in Afghanistan. Both sons of Nawab Naurez Khan were sentenced to death for murder of dozens innocent citizens; after their execution Nawab Naurez Khan also died in the prison due to heart attack. This is a bitter reality that after 1958 Military operation in Baluchistan law and order and peace was restored in Baluchistan for some time. Many Baloch Sardars joined govt., got funds in the name of development of Baluchistan that were deposited in their personal accounts in spite of being utilized for development projects in Baluchistan. Govt. of Pakistan turned a deaf year to this corruption in order to ensure peace in the province. After 1958, in 1971 the movement of treachery in Baluchistan once again started in Baluchistan with the support of India, Afghanistan and Soviet Union. Militants fighting in the Qalat were brain washed that with little struggle they would be able break apart whole Baluchistan from Pakistan and establish a communist state there. Look at the irony of the fate that those Sardars who had complete control over the fate of the Baloch public, who deprived public from infrastructure and education by utilizing funds for their personal use, were showing the dreams of socialism to Baloch people to make them fuel for militancy against state. 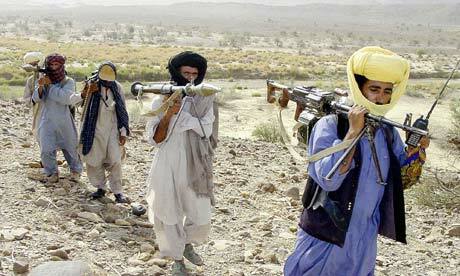 In short another military operation was conducted in 1971 with the support of many other local tribes except Bugti. After this operation skirmishes with foreign terrorists and conspiracies continued to be hatched but recent wave of violence, and external terrorism started when General Pervez Musharaf signed deal with China for construction of Gwadar port. Here I would like to mention that our present elected rulers are now trying to steal the credit of Gwadar port by quoting example of Pak-China friendship in the form of 6 lane motorway from China to Gwadar; in their previous rule they did nothing to develop Gwadar port except giving statements and photo sessions. The development of Gwadar port was unacceptable for our neighboring countries except time tested friend China; however, India was most worried in this regard as she was given a prime role to play in Afghanistan by USA (due to her personal incapabilities) after US invasion of Afghanistan. 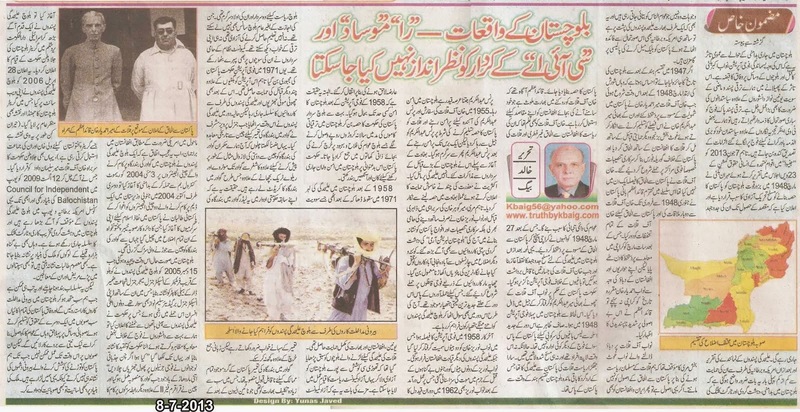 Look at the strange coincidence that a Baloch militant started treason by killing Chinese friends working on Gwadar port on 3 May 2004 while in October 2004, 2 Chinese engineers working on the construction of a dam in South Waziristan were murdered by TTP foreign funded terrorists in the name of imposition of Islam. Rapidly this series of terrorism spread out to those parts of the country from which the motorway from China to Gwadar port has to be constructed. The situation in Baluchistan deteriorated to limits when on 15 December 2005, terrorists targeted a Helicopter near Kohlu in which IG Frontier Constabulary Major General Shujaat Zameer Dar along with Deputy IG Brigadier Salim Nawaz was present and both officers got injured. On this terrorist attack when govt. of Pakistan decided to crush the terrorists some of our pro-militant writers opposed this operation and even wrote that what has happened if few (foreign) youngsters (terrorists) have fired crackers on armed forces personnel. After such great violence and terrorism when China succeeded in completing the construction of Gwadar port and started work on Karakoram Phase-II project, the supporters of BLA and terrorism in Pakistan got unveiled when BLA established an exiled govt. in Jerusalem, Capital of Israel. This announcement was made by BLA terrorists on their website on 28 April 2008 in which suggested map and flag of Greater Baluchistan was presented as well. What a coincidence (or similarity of conspirators), map of Greater Baluchistan was similar to the map which often had been presented by Wali Khan and his party for Greater Pakhtunistan. The leader of exiled govt. was declared Mir Suleman Dawood, Khan of Qalat. He established Council for Independent Baluchistan in Europe on 12 August 2009, and this council with the American and British support is not only projecting the propaganda of Separation movement of Baluchistan to cover up terrorists but also involved in provision of weapons, training, planning and execution of terrorism in Baluchistan. So with the safe haven in Europe and support of European governments, terrorists target innocent students, doctors and nurses providing them medical treatment and patients.